What is WCF. Explain its requirement if we have no of Distributed Technology. Address (Where): Address tells us where to find the services, like url. Contract (What) Contract that identifies the operations exposed by the endpoint. "It introduced as part of the .NET Framework 3.0 and has continued to develop it for the .NET Framework 3.5 which Visual Studio 2008"
It is Unification of all ex-Distributed Technology. It Support different Protocols as http, tcp, msmq etc. It support Multiple Message Patterns & most common Pattern is Request-Reply. WCF supports publishing service metadata( Data Above Data) formats specified in industry standards such as WSDL, XML Schema and WS-Policy. 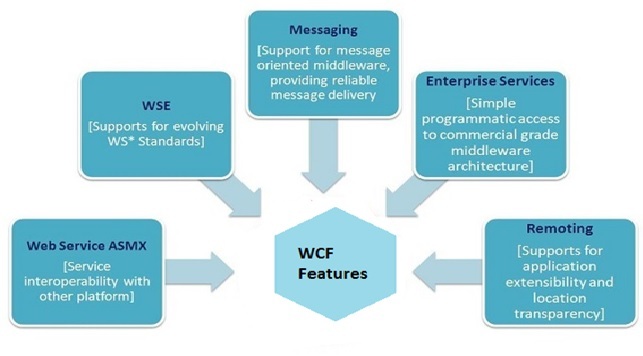 It is used to generate and configure clients for accessing WCF services. Metadata can be published over HTTP and HTTPS or using the Web Service Metadata Exchange standard. It is Secure Message Exchange Technique. It can be Implement as SSL or WS-SecureConversation. It enable to develop Service Oriented Applications which loosely coupled, A loosely-coupled relationship implies that any client created on any platform can connect to any service as long as the essential contracts are met.